Florence (affectionately known as Flossie) was born to Charles and Josephine Crittenton in 1877. Tragically at age 5 she contracted scarlet fever and passed away. Her parents were grief stricken and following a spiritual awakening, Charles Crittenton was compelled to act, to leave a legacy in his daughter’s name that would provide hope, compassion and dignity to young women and their children. Charles travelled the country in a railroad car and donated $500 to any group willing to set up an organization to help women and children. Of the original 78 agencies 26 remain today serving the individual needs of their communities. 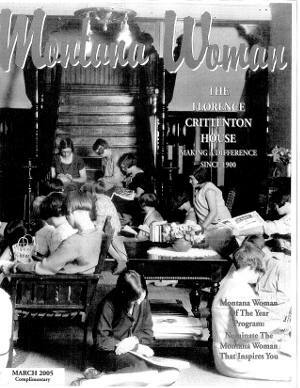 With the help of others Florence Crittenton in Helena has estimated to have served tens of thousands of young women, children and families. Florence Crittenton in Helena is a private, 501 (c) 3 organization that has worked with young families for over a century. The mission has remained much the same but the implementation of services has changed over time as the needs of society and of our community have changed. Once a “home for unwed mothers” who were generally sent away in secrecy and shame to have their babies and “give them up” for adoption, we have adapted and changed over the years to meet the most current needs of our generation.